Take Route 16 into Berlin. Turn left at the Berlin City Bank, then turn left at the traffic light (Dunkin Donuts). Turn right onto Mount Forist (before the post office), cross the railroad tracks, and go up the steep hill almost to the end of the street. Turn left on Russian St and you will see the Church. Take Route 16 into Berlin. Go through the traffic light at Dunkin Donuts. Turn right onto Mount Forist (before the post office), cross the railroad tracks, and go up the steep hill almost to the end of the street. Turn left on Russian St and you will see the Church. 9:00 AM Divine Liturgy, 11:00 AM Sunday School. 6:00 PM Liturgy of the Presanctified Gifts followed by Lenten potluck supper. HOLY WEEK: A full schedule of services is served; call for times. LESSER FEASTS AND SPECIAL SERVICES: Call for times. Holy Resurrection Orthodox Church stands like a gem overlooking the city of Berlin, NH. Its many-domed roof rises into the sky, its gold crosses glow in the sun. The church truly was founded on the rock of faith, and has served to preserve and spread the light of Orthodox Christianity throughout the northern reaches of the New England Diocese. In the early 1900’s, the lumber business of northern New Hampshire was booming. It was back-breaking labor, with cold, wet and dangerous conditions, entailing virtual exile from the company of wives and family. But there was plenty of work, and there was plenty of young men who followed the spirit of adventure and left their home countries of Europe to seek good fortune in the country of America. Events of the 20th Century always threatened the life of the Holy Resurrection parish. The Russian Revolution caused great turmoil in the Church in America: church leadership was disrupted, financial support from the Mother country abruptly ceased, and priests’ travel from Russia was curtailed. The effects of mill strikes and the Depression resulted in a substantial exodus of parishioners seeking work elsewhere. World War II caused another exodus; some families moved to take advantage of booming munition plant empolyment, others left Berlin as soldiers. Many never returned. Intermarriage with people of other faiths also caused a dwindling of parishioners. It became increasingly difficult to get, and keep, priests. In 1963, the church doors closed, the bells were silenced. For 11 years the church was closed. The domes and crosses tarnished, the windows cracked, the paint chipped, but through this dark time, somehow the foundation held. In 1974, Eugenia Tupick, the wife of one of the young men who founded the church, died. Her family asked Fr Peter Tutko from Springfield, VT to perform the funeral service. He came to Berlin, and through his appeal to Bishop Dmitri, Holy Resurrection was once again “found.” Fr Michael Westerberg was assigned to Holy Resurrection parish. To this “second generation” he had to re-teach the doctrines of the church. To do so Fr Michael encouraged the change of liturgical language from old Church Slavonic to English. With the help of an enthusiastic and talented seminarian, Drew Clements, a choir was trained. The faithful parishioners responded enthusiastically with hard work and dedication. The parish saw an opportunity to receive much needed funding and recognition by applying to the National Historic Register. Although the church community still consisted mostly of descendants of the original Russian immigrants and their spouses, Fr Michael opened the church doors to a wider community. Holy Resurrection began to be known not just as “The Russian Church” but as an Orthodox Christian place of worship. Over 80 years ago, Fr Arcady and 139 Orthodox Christians laid a foundation. Since then, each parishioner and priest has added to this structure through gifts of time, physical labor, prayer, stewardship, song or faithful presence. There are still parishioners whose forebearers were those visionaries who worked moving rocks or pounding nails with the hope that the church would always be here. 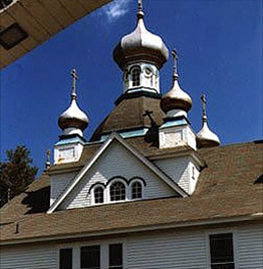 There are newly arrived Orthodox from Greece, who have settled in this area of northern New Hampshire. There are converts from diverse faiths and backgrounds who radiate the joy of discovery of this timeless faith. There are far-flung parishioners who with dedication travel from Maine, Vermont, Plymouth, and Littleton to participate in the services. The parish is currently serviced by various visiting clergy.